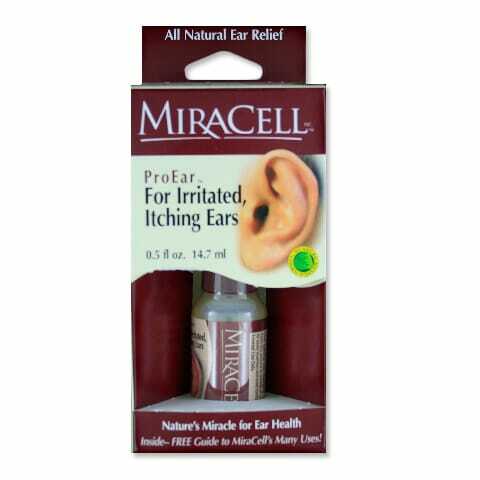 Miracell - Relief For Ears .5 fl oz. Miracell – Relief For Ears .5 fl oz. Dr. Chartrand reports that MiraCell, a blend of highly concentrated natural plant extracts, can effectively replace Oto-Eze and Eargene plus a host of other products. He notes that some make fair lubricants, but offer no anti-bacterial or tissue-friendly properties. Others are harsh to the tissue, can cause elicit lymphatic reflex (swelling) and also feed yeasts and fungi that often harbor in the disturbed ear canal. MiraCell is a proven, safe, all-natural botanical solution to help develop and maintain healthy ears. MiraCell is gentle to the ear, and lubricates without starving skin cells of oxygen. MiraCell reduces the possibility of discomfort caused by unhealthy ears. MiraCell has mild antibacterial, antifungal, and anti-yeast properties. MiraCell will soften ear wax for easier removal and less damage to the keratin layer of skin in the ear canal. When used daily, MiraCell not only helps maintain healthy ears but also skin in general. Never insert more than 1/3 of a Q-tips into the ear canal. Never scrape the sides of the ear canal with Q-tips. Avoid using boric acid, hydrogen peroxide, acetic acid solutions in your ears as much as possible. Ask for a video otoscopy exam by your doctor or healthcare professional periodically. Use MiraCell botanical solution to prepare ears for new hearing aids. Use MiraCell to soften earwax before removal. Maintain ears by using MiraCell once per week (at night) if you swim, wear hearing aids or change altitudes often.